Racers ... Start your engines. The 62nd annual Weyerhaeuser AuSable River Canoe Marathon wrapped-up today. The winners, Andrew Triebold and Steve Lajoie, finished the run from Grayling to Oscoda with an unofficial time of 14:17:42. Triebold and Lajoie were the winners of the race last year, along with 2004, and Triebold was half of the 2007 winning team, as well. 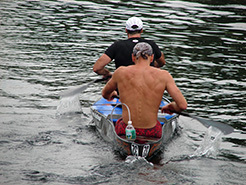 A record number of entries were recorded this year (over 90), although the record time for the race was set in 1994 at 13:58:08 by Serge Corbin and Solomon Carriere of Canada. Even completing the grueling 120-mile race is a feat of great athleticism, and although fly anglers in general are no fans of the average weekend rental canoer, in my experience the racers I’ve met on the AuSable have been courteous, wonderful people. True|North|Trout congratulates Andrew Triebold and Steve Lajoie on their win! As a bit of history, and an enjoyable bit of perspective, check out this recap of the 1973 race in the form of an essay written by Jim Harrison and published in Sports Illustrated entitled “A Machine with Two Pistons” on the win that year by Luc Robillard and Jerry Kellogg, and on the dynamics of racing back in the earlty 1970s. Interesting to see how the race, the racers, and the boats has changed, and how they have remained the same.